So tomorrow Google will shut down Google Reader. I’m sure for many this is a non event but for me it’s been an essential tool for years that I will really miss. However this isn’t the end for RSS feeds as has been reported. Instead there’s been a surge in new services and app’s taking advantage of Google leaving the market. Before looking at alternatives the first thing to do is back up your subscriptions via Google Takeout. With that step complete you can then try out the many alternatives that have sprung up oner the last few months. Here’s my thoughts on the few I’ve tried over the last few weeks. Feed Wrangler takes a different approach than the many other Google Reader clones. Feed Wrangler is a website where you can import and view your feeds and the developer has also released app’s for iOS and also an API so that app’s like ReadKit and Mr Reader can be used to sync your feeds. Once your feeds have imported you will notice that there are is no folder or tag support. Your reach your articles by visiting Unread, All Feeds or Starred. I found this quite disorientating as I’m used to browsing the many feeds I subscribe to via folders/tags. Feed Wrangler’s most powerful feature is Smart Streams and that did allow me to create a folder structure that I’m used to. Create a new Smart Stream and once it is named you can select from all feeds or a select few to display in a Stream. The trick with Streams is that a search term can also be applied, so you could have a stream based on all your feeds that pulls out posts on Glastonbury or E3. While only search terms are supported right now, it would be great to see date ranges or authors supported so you can pull out articles easily from the past – Olympics from August 2012 for example. It’s also easy to add a Stream that pulls out your essential reads – those feeds that you don’t want to miss but when you’ve had a busy few days and faced with 2000 articles to read you want to quickly read those important ones only. Smart Streams is great for that. Feed Wranglers presentation of articles is nice and clean. The UI doesn’t get in the way and the articles are presented well. Speed on the web app is good enough and there is similar keyboard shortcuts for Google Reader refugee’s. The iOS app’s are fairly basic right now but do enough although I’ve been mainly using other clients with Feed Wrangler so I don’t think this is reason alone to move to Feed Wrangler. Pocket, Pinboard and Instapaper are also supported as Read Later services. Feed Wrangler costs $19 a year bought from the website or as an in-app iOS purchase. 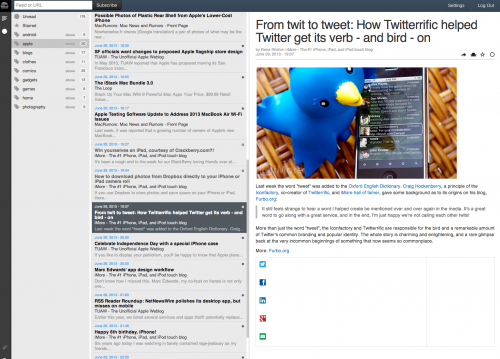 Feedbin provides an almost straightforward clone of Google Reader. It’s a paid service ($2 a month or $19 a year) and once your feeds have imported you will be immediately familiar with the web app and it’s layout. It supports keyboard shortcuts so you can easily navigate through folders and feeds. You can view articles in a couple of different ways but out of all the new services I tried I found Feedbin’s rendering of articles the worst by quite a margin. 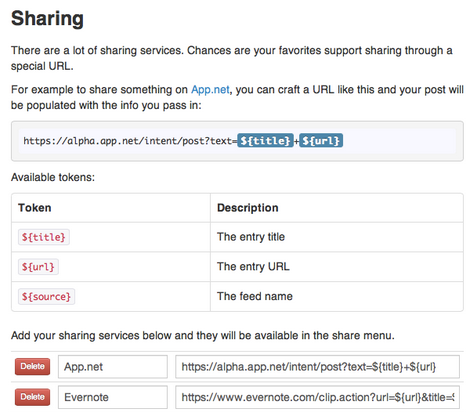 Sharing is very flexible as you can set up sharing to the service of your choice via URL’s. While this allows for great flexibility (and there’s a good list of URL’s on Github) in many cases it is no better than bookmarklets so it feels less integrated. With Feedbin’s API in place app’s like Mr Reader and Readkit give you a far better reading experience than the web app but I found the overall performance of Feedbin slow compared to other services. Feedly has been around for a while and was always an alternative to Google Reader but only if you wanted to use Feedly’s website or mobile applications. It also chased the magazine market in presenting feeds in a far more visual manner like Flipboard than what users in Google Reader are used to. However with the demise of Google reader they stepped up their offerings, focussing on features that Google Reader users will really appreciate and also providing a sync service for other applications to rely on. Getting your feeds into Feedly is really easy. Sign in with your Google credentials and feeds are sucked into Feedly as well as your Reader Favourites. 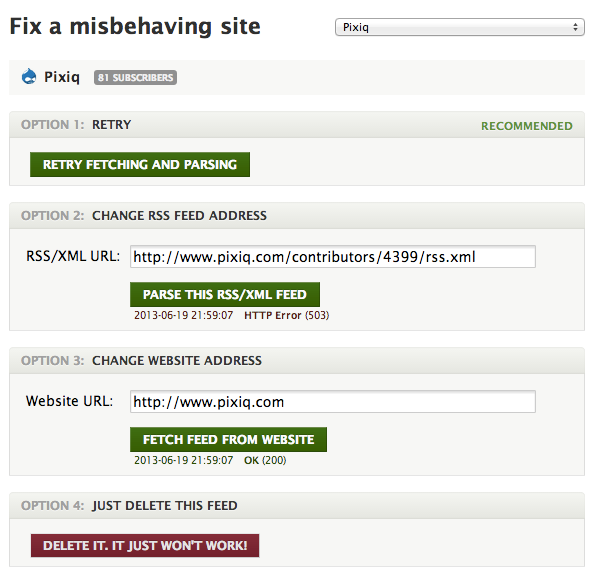 Folders are respected so you will instantly feel at home in the web application. Keyboard shortcuts are mostly the same as in Reader but a few are different and annoyingly so. In the web app there are a variety of views for your feeds and nicely they can be set differently for each folder. 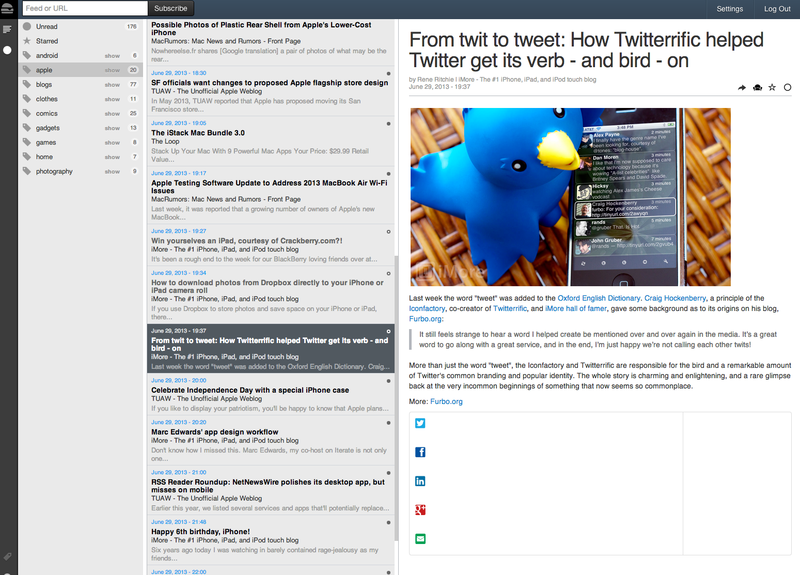 The views are Magazine, Cards (like Pinboard), Full and finally ‘Title Only View (Google Reader)’. Yes, thats what it’s called just in case you are in any doubt on the inspiration for that view. Presentation of articles is nice and clean and there is some minor customisation options allowing you to change link colours and overall theme colour. Feedly does show adverts on it’s home page called Today but I’ve found the display of content on that page hit and miss however you can change your default page so you never need to see Today. Feedly’s maturity as a service is best seen when it comes to adding and managing feeds as it’s all done via drag and drop and works really well – far better than any of the other new services. 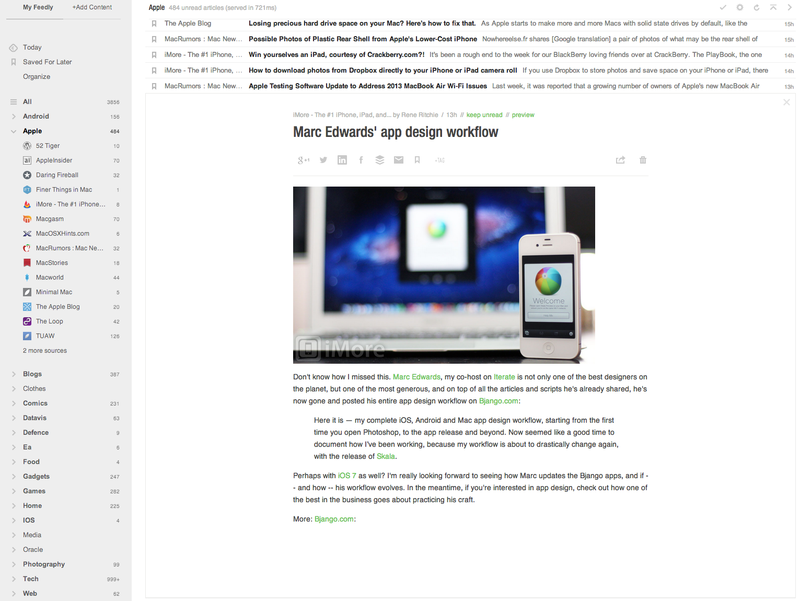 The Feedly app’s on iOS are OK. They work well enough but I just don’t like the styling of the app’s. They’ve went their own route when it comes to displaying of feeds within a folder and it just feels wrong. The overall app isn’t smooth either. However with the addition of Feedly API there are now many alternatives for viewing Feedly on iOS or Android including Press, Reeder and Mr Reader. The advantage Feedly has is size and hence scope. 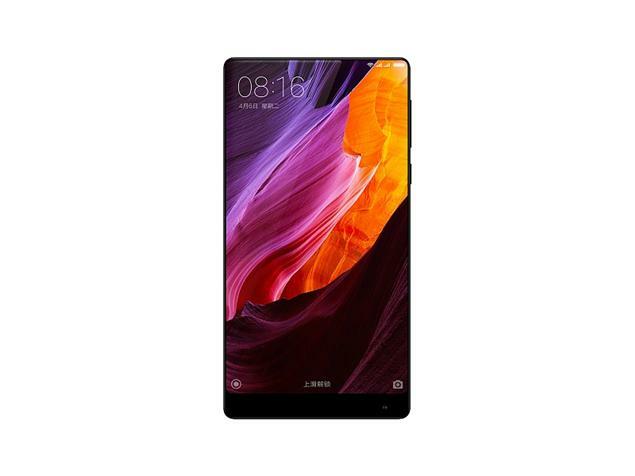 It supports almost all of the large sharing services, has great flexibility via IFTTT support and has developed tremendously over the last three or four months. It’s a free service and for many has become the easy alternative to Google reader. Newsblur like Feed Wrangler is trying to offer more than a traditional RSS reader normally would. It’s been around for over two years now and while initial versions were slow and the design wasn’t the best, the developer of the service has really stepped on the accelerator over the last few months to support the influx of users from Google Reader. Importing from Google was easy and it supports folders so already familiar to Google Reader users. Keyboard shortcuts feel familiar and the web app has lots of shortcuts to mark content as read and also easily see how many articles are unread etc. Newsblur really offers a lot more than other RSS readers. On importing from Google Reader feeds that are no longer available or cannot be reached currently are marked with a yellow exclamation mark, with Newsblur offering options for dealing with the problem. 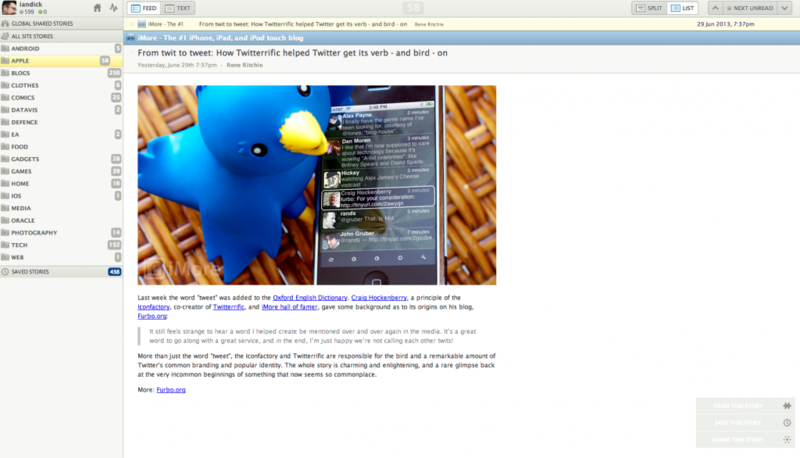 I found articles were presented really well in Newsblur and also it works really quickly. Content is prefetched so I found articles were displayed quickly and accurately when moving through my feed list. One feature not seen elsewhere is that article edits can be displayed to allow you to see how a site edits articles over time. Techcrunch has an amazing amount of edits for example – getting content out first still seems to count the most for some of these sites. 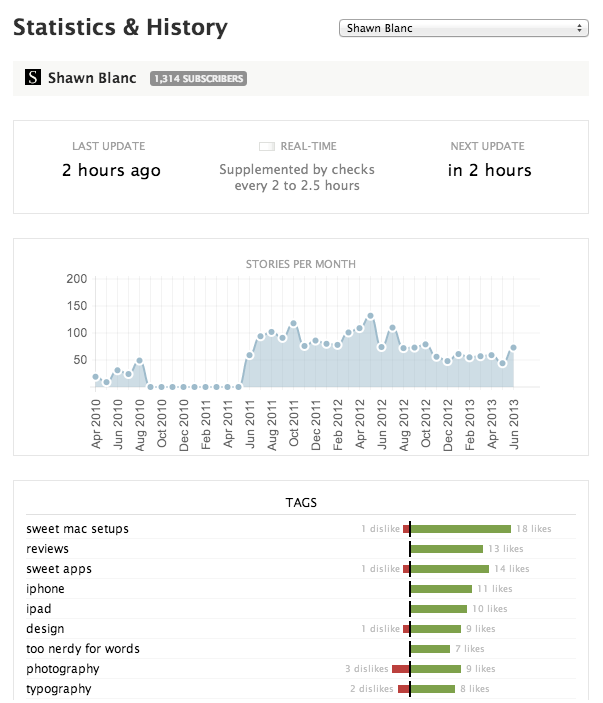 Against each feed Newsblur can show a number of stats – tag counts, post frequency, subscribers etc. 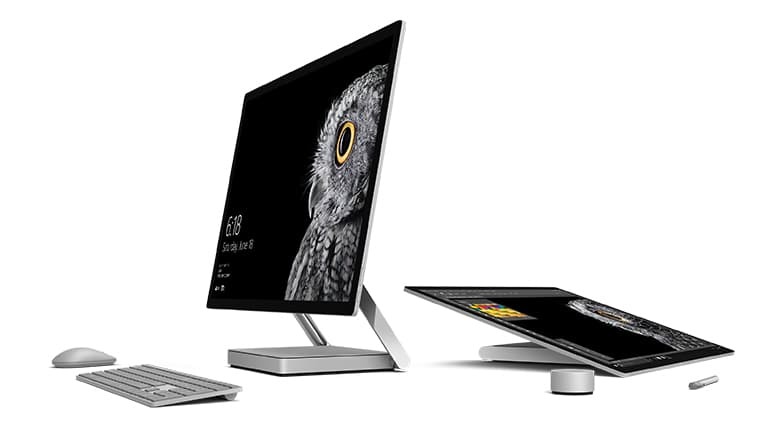 Not entirely necessary but nice to see. You can also configure how each feed should be presented, so you could view a site in it’s original view if it’s been nicely designed and for those that are less visually appealing you can view just the story only in a simple text view. You can tweak fonts and font sizes and also configure Newsblur to open sites in new tabs. There’s also great support for sharing services with all the favourites nicely integrated and Newsblur also has it’s own social sharing service – Blurblogs. 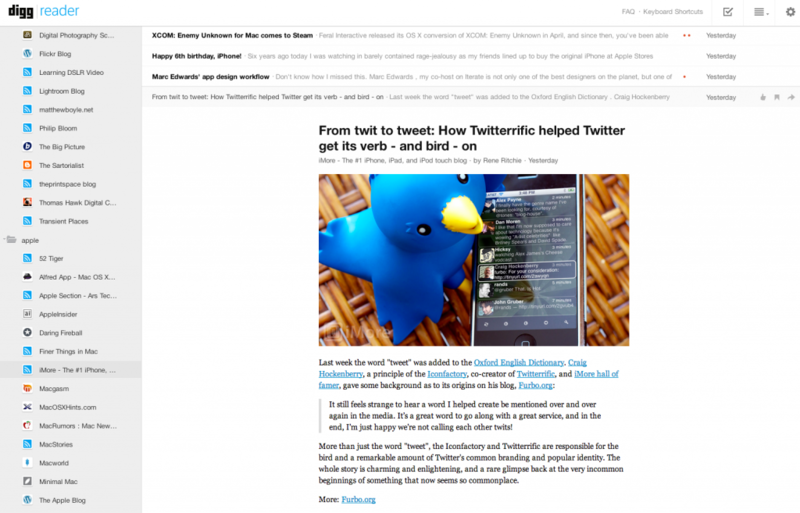 Signing up to Newsblur will give you a site on the web that you can share stories to. People can comment on your shared stories and share on from that site. You can also follow other Newsblur users and follow their shares and you can see all your own activity in an activity list in Newsblur. Newsblur differentiates from other services again by offering Intelligence Training. This feature allows you to select an author, tag or word from an article or feed and give it a thumbs up or down. Once this is done any article that matches a thumbs down will be hidden from view. You can still toggle the feed to view the hidden content but it’s another great way of weeding out good content from bad, especially for noisy sites like Techcrunch, Engadget or The Verge. Newsblur subscribers can make use of iPhone and iPad apps which support all the features of the web app. There’s also an Android app too. The only feature I missed was offline syncing but that is coming in a future release. About the only other feature I can see that is missing is search but it took Google Reader a while to add that so that’s something I can pass on. 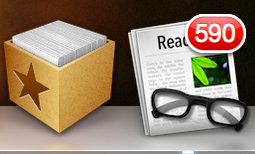 One final point is that Readkit on the Mac now supports syncing with Newsblur. Currently it doesn’t support training or much of the focus mode features but that is promised in future updates. Newsblur is free for up to 64 feeds and is $24 for a year for unlimited feeds. I think it’s a great service and well worth consideration. 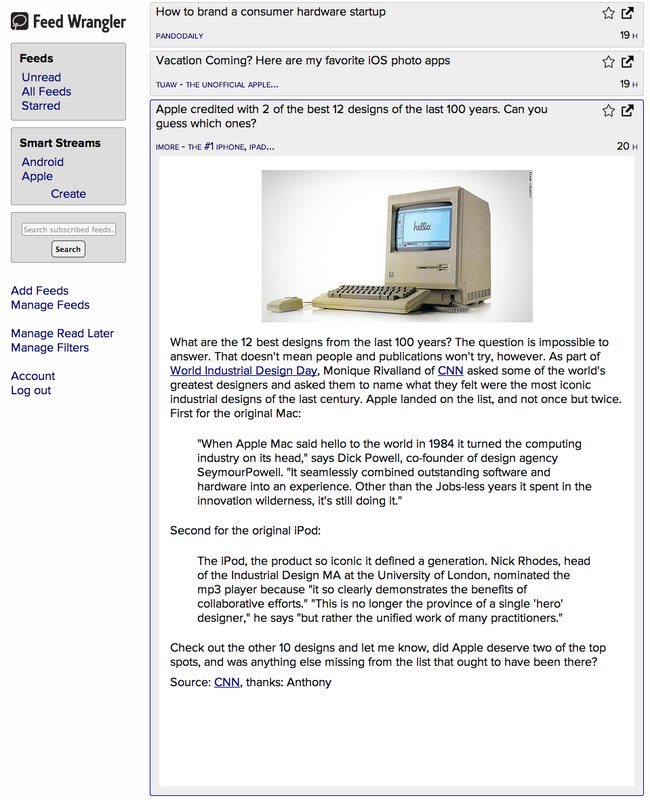 Digg Reader is probably the newest RSS service and in many ways it shows. Launched just a few days ago you pull in your Google Reader feeds by logging in with your Google credentials. It took a while to import and display properly but I’m putting that down to the service being hammered as Digg is still a big name and there’s not long now until Google shutter Reader. Digg supports folders and so the presentation is very similar to Google Reader. Although articles are displayed cleanly I found it difficult to see what was new, what was unread etc. The site though was fast and considering it’s only been three months since the Google announcement it’s impressive to see what has been built. Sharing options are limited though which is not a great surprise as Digg will want to build out their Reader around Digg and Instapaper which they now own. 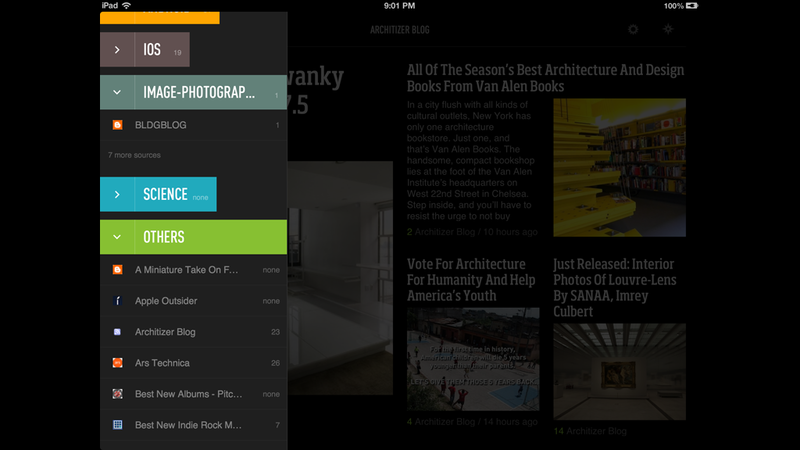 Digg’s iOS app’s are fast and present articles cleanly. However there are no Android options at the moment and no third party support. If you like the Digg app’s you are in luck but if not there are really no options at the moment. Digg Reader is free and although it’s early days I can’t really recommend it. One surprise of the impending closure of Google Reader is how it’s affected the applications I use day to day. I never used the Google Reader website instead doing all my feed reading through Reeder for iOS and Mac and Press on Android. Press has been updated with Feedly support but surprisingly Reeder is falling behind the competition. iPad and Mac versions will be withdrawn from sale tomorrow while the iPhone version has went free with added sync support for Feed Wrangler, Feedbin, Feedly and Fever. The developer has decided to focus on new versions rather than update old app’s. While understandably the Google Reader change and subsequent lack of one standard replacement causes extra work it’s left a rather large gap in my feed reading process. Step in Readkit. This Mac only app was previously good for catching up on Instapaper and Pocket articles but version 2 brought in RSS support for Newsblur and Feedly with an update just a few days ago to include Feed Wrangler and Feedbin. This has replace Reeder on the Mac and while it doesn’t have all of Reeder’s features and isn’t as fast as Reeder when syncing, it’s a far better experience than using the web apps of most of the services mentioned above. It’s only £2.99 from the App Store which really is a bargain. On iOS I’m now using Mr Reader and Newsblur’s own app. So which service replaces Google Reader? For most Feedly is the strongest option and it’s free so it’s a no brainer to move to that service. For me I much prefer Newsblur so that will be my RSS service of choice although I will keep an eye on Feed Wrangler as improvements to Smart Streams could be really big. While it’s disappointing to see a service I use daily being shutdown it’s great to see some true innovation now that firms are competing on a more level playing field. Farewell Google Reader.